This Friday, 9th March, is the big day for the Birmingham Children’s Hospital Charity’s Big Bandage event. Big Bandage is an annual event, when they ask as many people as possible to “Be Brave in Bandages” – doing anything from shaving their heads, waxing your bosses legs, or taking on a personal challenge – something which “tests their nerve and pushes their comfort zone”. This year they also have an abseil event you can take part in, on Saturday 10th March. They are challenging their supporters to abseil down from Birmingham’s iconic Fort Dunlop building, and there is still time to sign up. If you want to take on a different type of challenge, there is still time to get involved before Friday – just head to the website for more info. The lovely folks at Birmingham Children’s Hospital Charity got in touch and challenged me personally to do something brave in bandages, so I’m heading to a fab South Birmingham hair salon, Cisoria, tomorrow morning* – and my hair – or a least a large chunk of it (something like this!) – will be turning bright pink. We wanted to do it all to begin with but my hair is too dark to get it done in the time we have, and to be honest permanently changing over half of it is scary enough! I’ve had pretty much the same hair style since I was a teenager. I’m super grateful to Cisoria for wanting to get involved – make sure you check out their Facebook and Instagram. 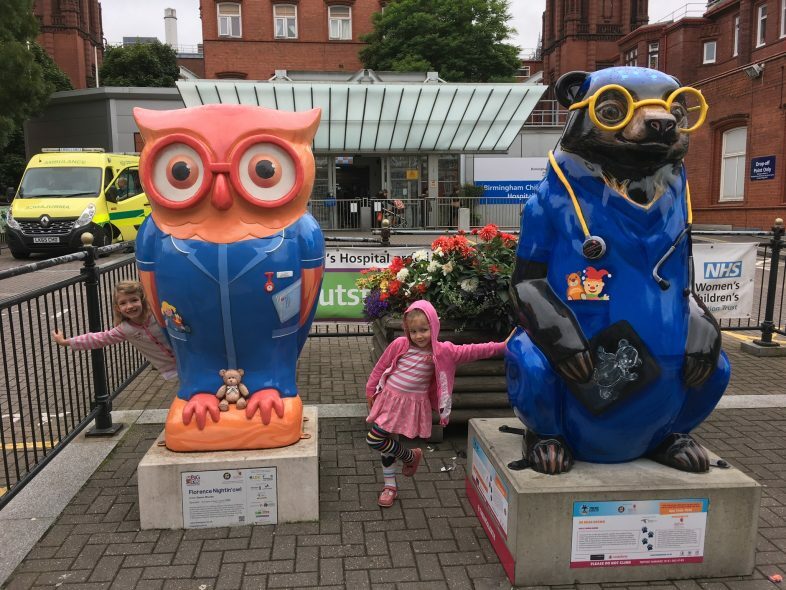 Birmingham Children’s Hospital is a cause close to our hearts as we have been taking Lydia there for a few years now for her squint, and they have been so great with her. I’ve been blogging about our visits to the hospital for a while now so I’m really happy to be getting involved with promoting Big Bandage for them! A friend of mine has this to say about the hospital: My son has been treated at the children’s hospital a few times throughout his life so far. He is registered under the hospital in the eye department. The care he has been given by the eye department, A&E and also ward staff, has been second to none. The staff are all friendly, really caring and makes hospital visits fun. Check back tomorrow to see what my hair looks like! I’ll be sharing before and after photos, and no doubt will be going a bit barmy on social media too. And please, please, please, either get involved if you can, or donate if you can. It’s such an important cause. *Well, as long as we have a water supply in the morning, it’s been a bit hit & miss after the recent crazy weather damaged the pipes under Birmingham! Wow well done Hun this is amazing! Such a fab thing to do! Can’t wait to see what you look like afterwards!! All the best! Really wonderful cause… can’t wait to see how your hair turned out!